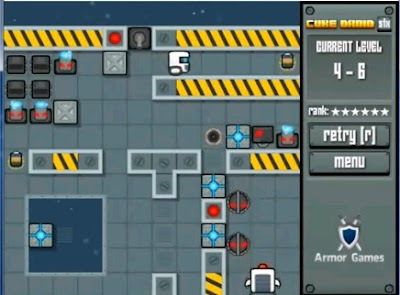 Cube Droid Saves The Galaxy is another action puzzle adventure game developed by armorgames. In the game, you play as the little cube robot whose mission is rescue his galaxy from the invading metal squares and robots left behind by some mysterious spaceship. You must prevent the scrap metals from engulfing every planet in the galaxy by collecting the batteries that holds the cubes together. It won't be that easy for you have to overcome obstacles including but not limited to, laser turrets, enemy droids and cannons. Anyways, CD offers entertaining puzzles with fair difficulty as you progress through the game. If you got really stuck at some point of the game, this Cube Droid walkthrough can help you out win all of the levels in it.